Especially this sharp shooter... Dwayne Wade! He's heating up... From downtown... Three!!! 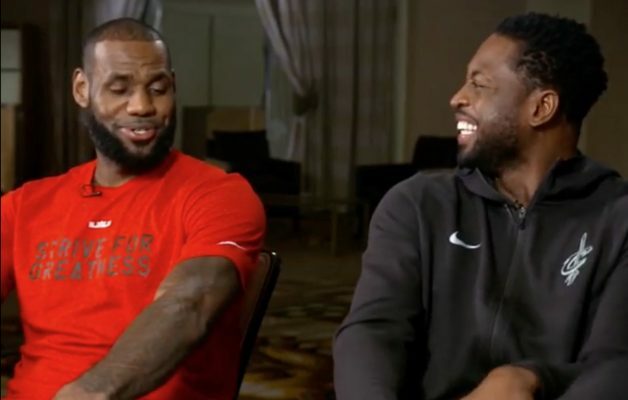 It's no secret that Dwayne Wade & LeBron James are close like Patrick Star & SpongeBob SquarePants, partners-in-crime like Ren & Stimpy, & inseparable like Batman & Robin. Everybody knows the old saying, keep your friends close & your enemies closer. This couldn't have been more accurate as proven by the NBA's closest dynamic duels. In a recent interview, D Wade took it upon himself to fire shots at The King! James was aware Wade was joining him in Cleveland. However, The Chosen One had no idea his Banana Boat Buddy was coming for his throne. In an exclusive interview, D Wade held The Association hostage & crashed Twitter for 23 grueling minutes. Not only did he expose his court mate, he washed, rinsed, & hung LB out to dry. Although LeBron James has a network of $400 million, a salary of $30.96 per year, endorsements totaling more than $452,163 per hour, D Wade insist his best friend will never go broke with his penny pinching ways. Wade claimed LeBron is the cheapest dude he's ever met. He announced LeBron never uses his mobile device if WiFi is not available & he always saves packets of condiments from fast food restaurants to squeeze the contents into mason jars he hides in his secondary master suite. He also chuckled about James being an extreme coupon-er that always sends his butler to stores with tons of discounted clippings. Damn, I know a couple of folks that can talk to Mr. James for money management advice. Any hoots, climb on The Family Tree below & share your thoughts about My Nephew Dwayne Wade's shots firing situation! Oct 22 LaVar Ball Pulls-Up On Patrick Beverley!!! Oct 15 Elderly Man Hid In Woods For 10 Years To Escape Wife!! !